Your friends or guests will love receiving this adorable keepsake giveaway for its high style and practicality. 1. Please allow a little bit size deviation due to manual measurement. 3.Satisfied with the item ,please leave a kind review .Thank you . 4.Any questions ,please feel free to contact us .Our team will sincerely service on time . 1 Pcs x Cute Mini Handmade Scented Candle . Get Your Lovely Candle Favors Gift Set Today! 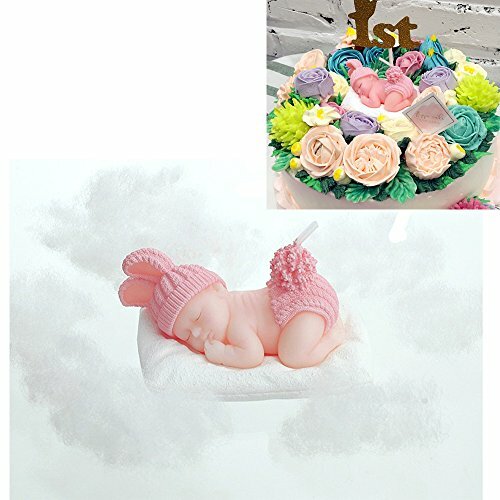 Premium Pure food-grade wax, perfect to be babies' birthday cake topper or party decoration .This Candle is just for Lighting or decoration ,birthday cake topper or party decoration . Exclusive design, carefully hand carved and painted ,PVC box with "It's a Girl ! "Silkprinted pink ribbon bowtie ! Your friends or guests will love this adorable keepsake giveaway baby shower or birthday party gifts!Attached with "For You " greeting label, write down your love to to make it an ideal favors for baby's Christenings, birthdays or any baby occasion. Please Note: this is just a candle ,not a toy and inedible, please take away from babies or kids ! If you have any questions about this product by Beyonder, contact us by completing and submitting the form below. If you are looking for a specif part number, please include it with your message.